Just out today are the numbers on how many people are employed in the U.S., but if you drill deeper, you can find out current employment data on Louisiana and also the New Orleans MSA. Looking at employment growth provides a snapshot of consumer spending driving economic growth and can help you plan a wide variety of business decisions such as: commercial real investment, inventory size, payroll expansion or contraction and new location demand. The chart and table below shows the U.S. employment growth in 3 month increments which evens out the peeks and valleys . It is seasonally adjusted and starts in 2003. 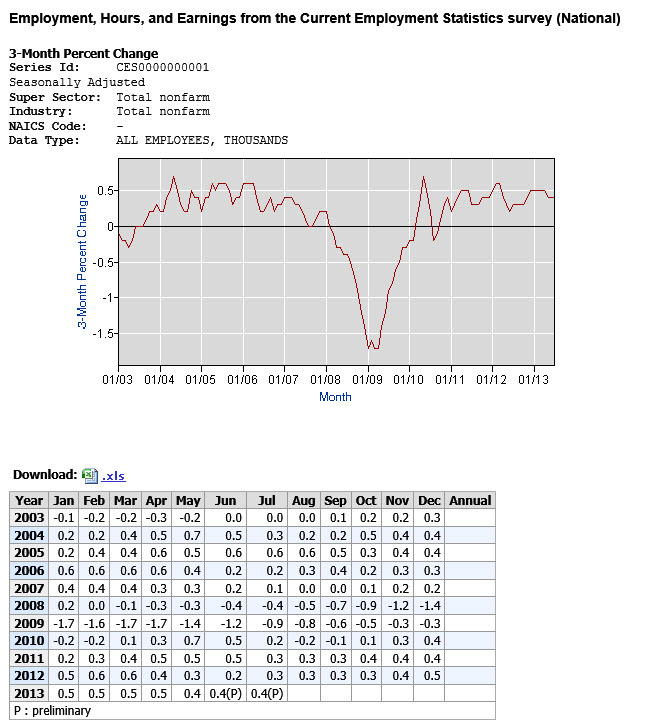 The most recent period shows 0.4 percent growth for the period ending July 2013. The chart below shows the same 3 month percent change in non-farm employment, seasonally adjusted, but since it must take into account the large decline in 2005 due to Katrina, the subsequent data is difficult to analyze. The chart below compares the New Orleans employment market growth to the Houston market for the same time period, seasonally adjusted. 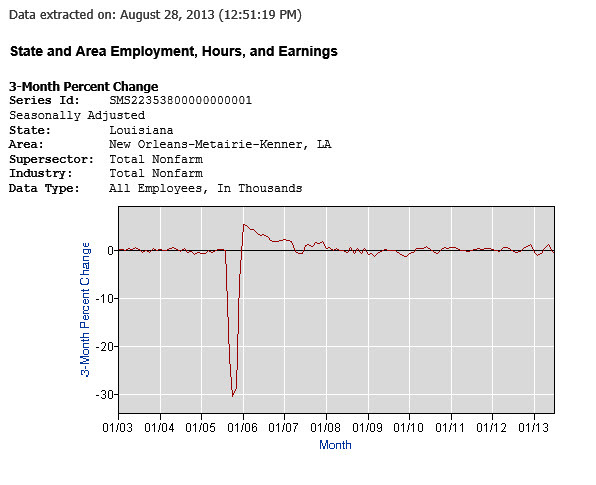 Current employment growth is still positive whereas the New Orleans employment growth is negative. The chart below starts the time period in 2007, after Hurricane Katrina and shows 2013 employment declines similar to 2009. In summary, the New Orleans employment growth rate and therefore the economy is declining and unable to enjoy the employment growth occurring in both the national arena and nearby Houston market. 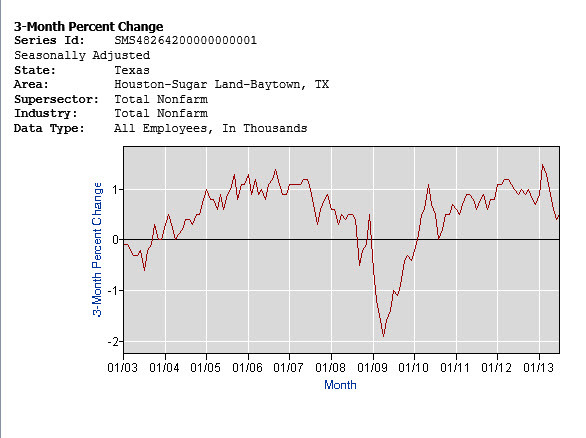 Both Houston and the U.S. economy are growing their employment, although not as fast as previous periods. For table data, email Robert hand at roberthand@cox.net. 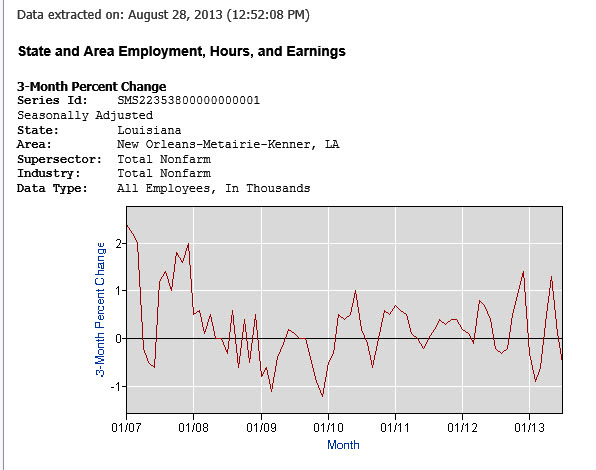 How Louisiana Employment Growth Compares to the U.S.
How Is The New Orleans Economy Doing?